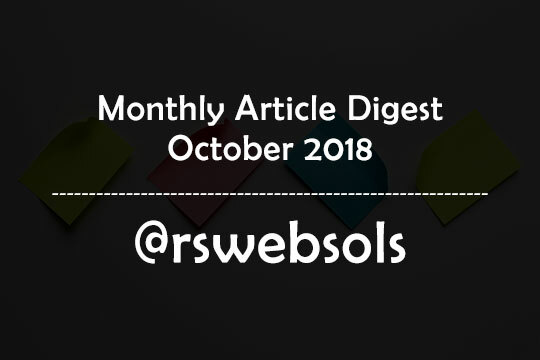 This is an article containing the monthly article digest of the month “October 2018” at RS Web Solutions (@rswebsols). You can easily find all our published articles of October 2018 in a ascending order by date. This is a monthly archive page to help our readers to give an easy-to-find list of monthly articles. Along with the article title, you can also able to read a short excerpt of each article. If you find an interesting article that catches your attention, you can, of course, click on the “continue reading” link to read the entire article. Happy reading! 1) Why Unique Content is Important for Your Website? 2) Google Featured Snippets – How They are Helpful? This is an article containing the monthly article digest of the month “September 2018” at RS Web Solutions (@rswebsols). You can easily find all our published articles of September 2018 in a ascending order by date. This is a monthly archive page to help our readers to give an easy-to-find list of monthly articles. Along with the article title, you can also able to read a short excerpt of each article. If you find an interesting article that catches your attention, you can, of course, click on the “continue reading” link to read the entire article. Happy reading! 5) 8 Excellent Tips for PPC Advertising You May Not Know! 8) What Are the Experts Saying About the DJI Mavic 2 Pro and the Zoom? 9) Data Encryption: What is Encryption? Types of Encryption and Security! 10) Website Color Schemes – A Powerful Marketing Strategy! 11) 5 Common Issues with WiFi Networks You Should Know! 14) Magento Vs Shopify Vs WooCommerce: Which Platform to Choose? 18) How Does Video Marketing Help in Generating Leads? 25) How Creating Memes Can Help You in Your Online Marketing Efforts? 26) What are The Different Phases of Mobile App Development Process? How to Craft an Excellent 404 Error Page for your Clients?